Maybe it's the chocolate milk the Eagan student managers hand out to the players. Maybe it was the record crowd on hand. Maybe it's the systems the Wildcats continually put in place. 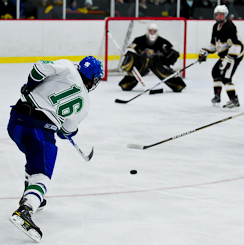 Whatever the reason, Eagan continues to show it plays big games against big opponents including the Wildcats' 4-2 victory over Apple Valley on Thursday, Jan 6., at Eagan Civic Arena. "It's a pretty good rivalry," Eagan coach Mike Taylor said. 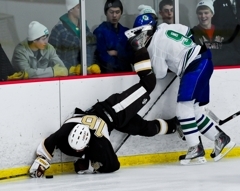 "It was a good high school hockey game and people got their money's worth tonight." The hype for the South Suburban rivalry game was intensified by the latest Class 2A rankings which had Apple Valley ranked eighth behind Eagan, ranked seventh. That same hype led to over 1,000 people packing into Eagan Civic Arena to take in the action. "It was the best crowd we've ever had here which tells you the draw Apple Valley brings," Taylor said. "The community of Eagan coming out like that was really great. I was impressed. "It's the biggest crowd I've ever seen here." The Wildcats' home crowd had to be pleased with the result of the game which saw junior forward Will Merchant score two critical second period goals. "I got a couple lucky bounces," Merchant said. "I just put my best chance on them." Merchant's second goal would end up being the game-winning goal after a late, second period surge by Apple Valley. A.J. Michaelson and Kris Goodman scored 13 seconds apart and recaptured the momentum for the Eagles shortly after Merchant's two goals. The Eagles' momentum was cut short as the second period came to an end. "Too bad that horn had to blow at the end of the second," Apple Valley coach Jerry Hayes said. "I'm going to be advocating for 20-minute periods from here on out." The third period goal would seal the deal for Eagan. "A win like this gives us two points in the conference standings and gets us off a loss on Tuesday (Jan. 4 to Minnetonka)," Taylor said. "I won't say much else about it cause we have to play (Apple Valley) again, and then we might even have to play them again. So that's anybody's game. "It gets us two points and that's about it." 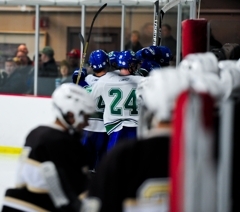 For Merchant and junior forward Michael Zajac it provides a bit more than just two points. "I think it shows us that we have the potential to play with anyone in the state," said Zajac, who had two assists. "The loss to Minnetonka was tough but we have to keep our heads up, keep working hard and keep having fun." "It shows that we're a good team and we can play against the best," Merchant added. 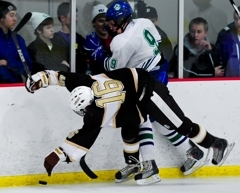 The Eagan-Apple Valley rematch is sure to draw the same amount of attention. The Wildcats will travel to Apple Valley Sports Arena on Saturday, Feb. 5, for a 2:15 p.m. battle. A major key to Eagan's victory was its ability to hold Apple Valley star forward A.J. Michaelson to one goal and keep Hudson Fasching off the score sheet. 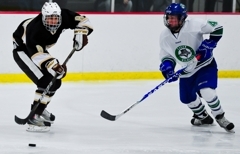 "Apple Valley has (Hudson) Fasching and (A.J.) 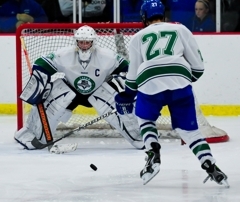 Michaelson and they're about as scary as it gets," Eagan coach Mike Taylor said. "Our game plan for them was to not give them clear rushes. Michaelson and Fasching are deadly on the rush. So we almost got to a point where we were designating a third man high just so they wouldn't get out and get a clean rush. "If you let those two out and let them get rushes, you're in trouble because they are gifted." The Wildcats' game plan proved successful. 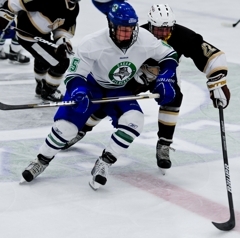 "We wanted to take the body on (Apple Valley's) first line (Michaelson-Fasching-Heuer) and play good special teams," Eagan forward Will Merchant said. "We wanted to move the puck, get it deep and make some plays. "Like every game you have to be ready to go." Merchant and fellow junior forward Michael Zajac were 'ready to go' for the rivalry game on Thursday, Jan. 6. "We wanted to come out hard, stay focused, work hard and not let (Apple Valley) get in our heads," Zajac said. "Always feels good to beat Apple Valley." 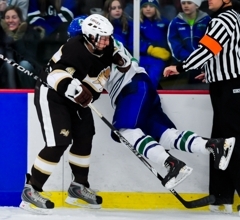 Apple Valley coach Jerry Hayes took his time in the visitor's locker room at Eagan Civic Arena after his team's 4-2 loss against Eagan on Thursday, Jan. 6, but when he finally emerged, he wasn't fueled by anger. "I thought we played well," Hayes said. "We haven't had a game in the last couple weeks. We knew it was going to be a dramatic increase in tempo from what we've seen lately. We didn't have a holiday tournament so it was a good test for us to see how our guys readjust to that type of tempo. "I thought we did a nice job in the second period not getting down, staying calm with the game plan and responding with those two goals late." The loss was Apple Valley's third of the season with their other two losses coming to top-ranked Eden Prairie and fourth-ranked Wayzata. "I was happy with the way we competed tonight," Hayes said. "The game in January is not as important as the game in February, which isn't as important as the game in March. In January you can't get too ramped up. If you win, you can't celebrate like you just won the Stanley Cup and if you lose you can't dwell on it like you just lost the Stanley Cup. "It's a mid-season game, it's our eleventh game of the year and we're getting close to the mid-way point. We wanted to see where we're at and we saw a lot of things - I'm sure we'll see more things on tape. It was a good hockey game, entertaining for the crowds and a great atmosphere. "That's what makes playing high school hockey in Minnesota so special." 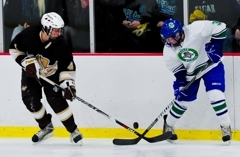 Apple Valley's Hudson Fasching has received a lot of attention for his play on the ice this season as he currently leads the Eagles in scoring with 25 points (9 goals, 16 assists). Although only a sophomore, the 6-foot-3, 200-pound star forward's future has also received heavy attention. Fasching currently has an invitation to join the U.S. National Team Development Program in Ann Arbor, Mich., next summer. Accepting that invitation would mean leaving behind his high school teammates and family in Minnesota. Although the choice remains with the young Apple Valley forward, a Dec. 17 article by the Star Tribune's Amelia Rayno has given a chance for several people to voice their opinions on what path they believe Fasching should follow. Apple Valley's coach Jerry Hayes was able to answer if Fasching has listened to those opinions or made his choice. "No -- he's worrying about being a 15-year-old," Hayes said. "I think that's the last thing on his mind right now. 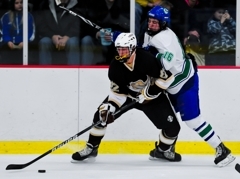 He was focusing on Eagan, now he can focus on Bloomington Kennedy (Apple Valley's next opponent on Saturday, Jan 8). He's pretty well-grounded and we're just going to worry about finishing out this year. "We'll worry about that other stuff in April." It appears Fasching's choice will wait for now. 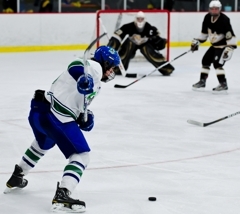 Will Merchant scored two goals and Tommy Bodeker had 30 saves as Eagan clawed its way to a 4-2 victory over Apple Valley on Thursday, Jan. 6, in front of a sold-out Eagan Civic Arena. An arena record crowd of over 1,000 was on-hand to watch the Wildcats battle the Eagles in what was an exciting game to the final whistle. 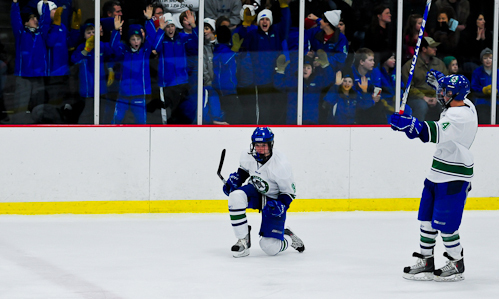 Connor McGovern and Sam Wolfe had the other goals for Eagan. Apple Valley's star forwards -- Hudson Fasching and A.J. Michaelson -- were relatively quiet as they were kept in check. Michaelson, the only one of the two standouts to find the back of the net, scored a crucial power-play goal in the second period. Kris Goodman notched the second goal for the Eagles 13 seconds after Michaelson's goal to bring Apple Valley within onen. 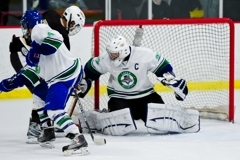 That would be the closest the Eagles came to a tie or lead as Eagan continued to stay hot against top-ranked opponents. Apple Valley will look to bounce back from the loss on Saturday, Jan. 8, at 7:15 p.m. when it hosts Bloomington Kennedy at Apple Valley Sports Arena. 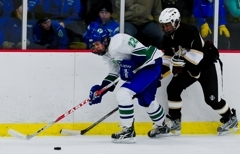 Eagan plays Eastview on Saturday, Jan. 8, at 7:30 p.m. at Eagan Civic Arena. For the first 12 minutes of the second period, Will Merchant was everywhere - including the scoresheet. The junior forward scored a crucial goal 3 minutes into the second frame putting the Wildcats up 2-0. Merchant would net his second 8 minutes later extending Eagan's lead to 3-0, which would prove to be the game-winning goal. The senior goaltender stepped up once again during a big game making 30 saves in the Wildcats' victory. Bodeker (pictured above) made crucial saves including several against Apple Valley star forwards A.J. Michaelson and Hudson Fasching. When Michael Zajac (pictured below) is on the ice, you can safely expect big things to happen. The 6-foot-2, 190-pound junior forward played great two-way hockey delivering hard hits and registering two assists for the Wildcats - one of them coming on Merchant's game-winning goal.